TRAI has released their monthly Indian Telecom subscription report, and according to it, India has total of 1002 million telecom subscribers, out of which 975.78 are wireless (mobile) and 26.27 are wireline (landline). In May 2015, a total f 2.44 million new mobile subscribers were added, whereas wireline saw a fall of 0.1 million. Most of the new mobile subscriber additions came from rural areas. Interestingly, April and May has been months of much slower growth. For comparison, March 2015 had seen addition of 9.31 mln whereas and Feb had seen 8.24 mln new mobile subscriber additions. The fall in the numbers have primarily come about due to the fact that Reliance (1.1 mln) and Tata (0.93 mln) lost subscribers heavily. On the Idea cellular once again topped the charts with higher number of new mobile subscriber additions. 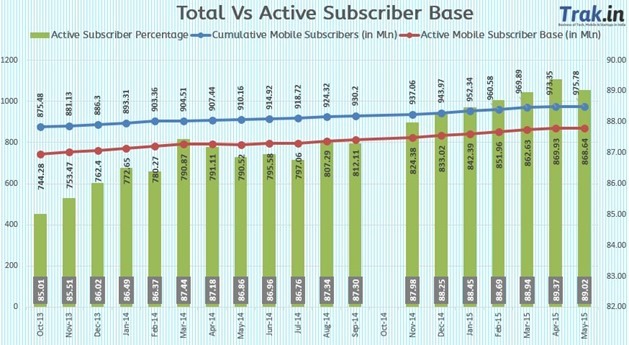 Here is how mobile subscribers have grown in India over past 1.5 years. Interestingly, active subscriber base fell in the month of May 2015. Last month, the active base had seen significant bump (see the chart below), but it showed marginal negative growth this month. In April 2015, the active subscriber base stood at 869.93 mln, whereas in May, it has dropped to 868.64 million, a fall of about 1.29 million. The active subscriber percentage has fallen to 89.02. Here is how active subscriber base has grown over past 18 months. – With an increase of 2.44 mln in May 2015, total mobile subscriber base has reached to 975.78 million. 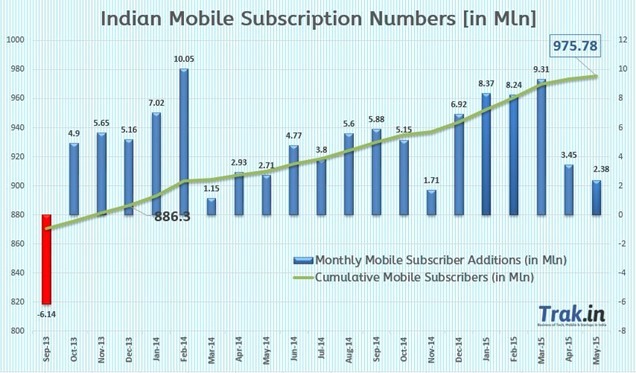 India had 9973.35 million subscribers by end of April 2015. – Urban India witnessed a monthly subscription increase of 0.01% percent or 0.05 mln subscribers, while rural mobile subscriber base increased slightly by 0.57 percent or 2.38 mln. 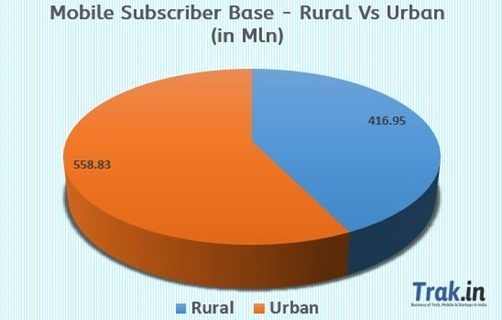 – Urban India has a total of 558.83 million, while rural India has a total of 416.95 million mobile subscribers. – Urban Teledensity decreased to 143.42 from 143.64 in April 15, while the rural tele-density increased to 48.03 from previous 47.79 . – 3.24 million new Mobile portability requests were made in month of May 2015, taking the total tally of MNP requests since launch to 160.25 mln. – Active Mobile Subscriber base decreased from 869.93 mln in April 2015 to 868.64 million in April 2015, taking the active percentage to 89.02 percent. Idea Cellular once again beat the market leader Bharti Airtel in mobile subscriber additions. Idea added 1.259 mln as compared to Airtel’s 1.190 mln. Vodafone surprising added much lower (427k) subscribers. Among smaller operators, Uninor added a respectable 929k which Aircel added 720k. 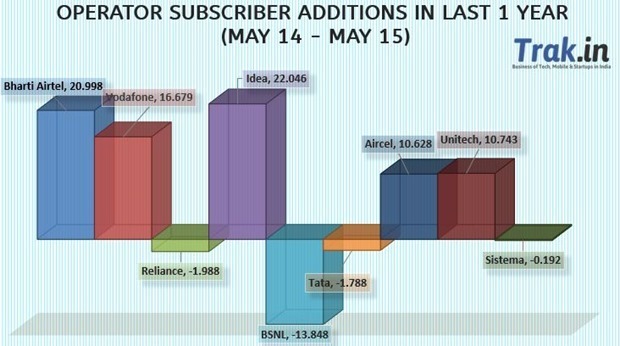 On the other end of spectrum, Reliance (-1.11 mln) and Tata (-0.927 mln) lost subscribers heavily. 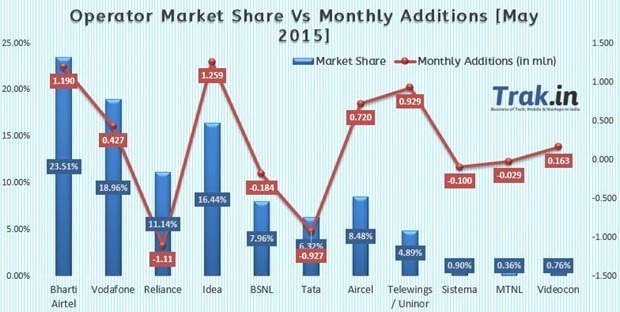 BSNL and Sistema were the other operators who lost subscribers as well. Idea Cellular’s stellar performance over past 12-15 months can be gauged from the fact that they have added 22 million subscribers, which Airtel has added shade below 21 mln. Vodafone added 3rd highest with 16.7 mln. Aircel and Uninor have also done well with both of them adding over 10.5 mln. Nice and informative article. Define everything about mobile subscriber details by statistic. Continue to write this type of article.